My Black Powder stats have been amended recently, mainly as a result of reading the book shown below: Frederick the Great on the Art of War, edited by Jay Luvaas. I can't really understand why this work doesn't get more publicity. Professor Luvaas wrote and edited this book in 1966 whilst teaching military history at Allegheny College. He was a mere Doctor at the time, but went on to hold Professorships at the US Military Academy, US Army Military Institute and the US Army War College. He retired in 1995 and died in 2009. Here he has taken on all Frederick's writings on military subjects and edited them into a themed and well ordered book, adding some judicious analysis and comment of his own. This is my kind of book: scholarly but easy to get to grips with. The book has recently been republished in paperback and is easily available in this form on Amazon for under a tenner. However, the original hardback is much more satisfying to own and I managed to pick one up for much the same price from the same website. I would categorise this book as a must-have for anyone desiring to understand 18th century warfare, along with the works of Duffy, and Nosworthy's Anatomy of Victory. And by the way, it is not to be confused with the work available through Caliver Books, Frederick the Great's Instructions to his Generals, edited by a chap called Hayes. This latter work only has 80 pages (Luvaas' has 391) and only covers the work stated in the title. The Instructions were written before the SYW and do not cover Frederick's later thoughts on warfare developed through his experience of that dreadful conflict. Thanks to Professor Luvaas we can hear the authentic voice of the greatest practitioner of 18th century warfare, 250 years after he committed his thoughts to paper. Anyway, one of the points made loud and clear is that the tactical superiority of the Prussian army was founded on its ability to manoeuvre better and shoot better than its opponents. Hardly a stunning conclusion, you will think; but it was having this point drummed home to me through this book that I decided to make a few amendments to my stats tables. 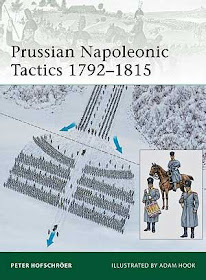 The superiority in manoeuvre is covered in the rules mainly by giving the Prussians a higher staff rating. I feel this is essential and has to be done, or you might as well be playing fantasy or imagi-nations (both highly respectable forms of wargaming but not what I am discussing here). In addition, it is tempting to give the Prussians special rules, such as 'superbly drilled', but I have not taken this route. The 'reliable' rule, for example, seems pointless if you have already decided the army justifies higher staff ratings all round. As for firing, the book informs the reader that even conservative estimates allow the Prussians 4 volleys a minute against 2 or 3 for most other nations. Frederick himself was much more bullish, claiming a 3 times superiority in firing for his infantry. Of course, the figures for rate of fire are subject to some dispute but I have accepted that the Prussian advantage was real and significant. Therefore, all Prussian regular formed infantry get 4 firing dice instead of 3. 'First Fire' is given to all decent quality infantry units of both the Prussian and Austrian armies as representing a basic tactic of the time (the Bavarians and Frei-Korps miss out on this). 'Superbly Drilled' is reserved for grenadiers to give them an edge in reliability, making them additionally suitable for their historic role of undertaking the most difficult attacks. I have made no changes to the cavalry, remaining convinced that the Prussians have the edge, and continuing to refuse the use of the 'heavy cavalry' rule. Note that I have decided to have the option of fielding 3 types of artillery; light, medium or heavy. I decided to differentiate these purely by range and ease of movement. Ranges are given in the tables. Light guns will count as the battalion guns mentioned in the rules for manhandling, whilst heavy guns cannot be manhandled. Medium and heavy guns will move limbered as per the rules, but light guns will get the movement for horse artillery. Finally, Frederick himself, if present, always gets a staff rating of 10. All comments welcomed, of course, especially those disagreeing with my conclusions. Wargaming is a learning process, like any good hobby. Thank you for reminding me about the Luvass book. 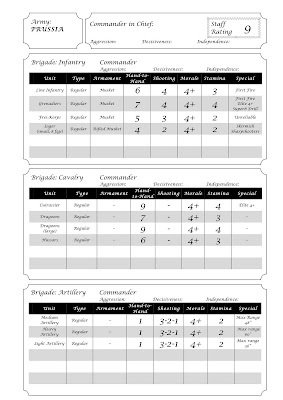 I agree that it gives one insights onto Frederick's military mind and it can help wargamers understand tactics easier. I also agree that the Prussians should have a superior movement rate over their opponents. Even Austrian generals marveled at the maneuvering speed of the Prussians. I'd also consider giving Prussian hussars an advantage over Austrian hussars. Interesting. I started with similar thoughts but have modified them. And by the last years of the SYW the better musketeer regiments were pretty used up so they should loose their better shooting and maneuvering. In my lists I make a distinction between the older musketeer regiments and the newer fusilier regiments. Regiments formed from impressed Saxons should be of lower quality too. One could develop three different Prussian lists; one for the WAS, one for the beginning of the SYW and another for the army by the end of it. And was Frederick really that good? Certainly aggressive (which gave him an edge in a cautious age) but he lost as often as he won. I recognise those roster sheets! I am wary about giving one extra die in BP, because it represents such a big jump (firing it is 33%). Of course if you are happy that the Prussians had such a weight of fire advantage then of course it makes sense. With WSS I wasn't convinced that platoon fire was an 'uber-system', so gave an extra first fire, rather than a game long bonus. I did consider a reroll for 1 die, (so limiting to 3 hits max, just improving odds) for the entire game or even one die of a different colour that was the only one that could be rerolled! I find wargamers willing to attribute all sorts of powers to a named unit based on one battle - my thoughts are "Perhaps they rolled lucky dice that day". This seems as good an explanation for those who wonder why unit x was so good at Battle A, but not battle B. Being a fan of BlackPowder this is interesting. Would you treat the fusiliers the same? I'm not sure how long this advantage in firepower would last through the war as raw recruits started to fill the ranks. I have read (somewhere) that the increased rate of fire was not necessarily more effective in casulaties inflicted. It implied that the drill sergeants were more concerned with number of rounds fired that the effect they had. Undoubtedly this had an effect on the enemy's morale initially but may hae worn off IF it resulted in wasted ammo. These are not facts just conjecture. Many thanks for the judicious comments. Certainly these are SYW lists only: for the WAS I agree they would need significant changes. I have never felt the need to distinguish between fusiliers and musketeers for the Prussians, simply because I have never read that the fusiliers were actually less well trained or disciplined - I am happy to be convinced otherwise. As for early/late war distinctions, I have often thought along those lines and perhaps this could be thought of as a list for 1757-1760. However, I have also read that by the end of the SYW the proportion of Prussians in the Prussian army had increased again and was higher than when the war started, though whether the training standard was maintained is another question. Duffy doesn't seem to make much of a distinction between the early and late war Prussians. 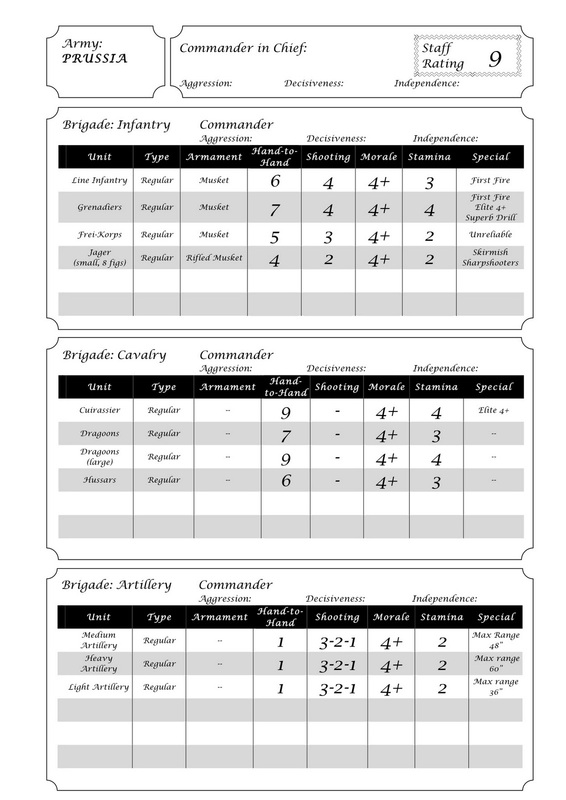 As you say, Last Hussar, there are plenty of alternatives to adding one shooting dice, but i finally decided to bite the bullet (sorry!) in order to make a real distinction between the Prussians and others. Another factor is that adding one to the firing stats is easier to remember in the heat of battle. James, for me, if I am giving the Prussians a SR of 9 normally, it has to be 10 with Frederick in charge. He may not have always been right, but he had a knack of getting what he wanted done, done: or at least started! AS you so rightly say, aggressive in a cautious age. We informal students of war at are the mercy of the reading we have done, and I have to admit my views change as my reading continues. I do try to refer back to works i have read previously when encountering new ideas, and attempt to construct a balance, but one can only do one's best and be prepared to alter one's views in the future. I give the Fusiliers more 'normal' ratings (in my list the senior musketeer regiments get the 'Superbly Drilled' so they move faster/more reliably). So for shooting,HTH and morale saves they're the same, just don't get that one move on duffed command rolls. How would you rate Ziethen and Sydlitz then? Or Nadasty or Brown on the Austrian side? Some of the Prussian generals were duffers too. After comparing results at Kolin and Leuthen (same tactics, same commanders, very different results)I tend to agree with the Last Hussar; maybe Frederick and Daun had some crap command rolls on the days of their respective defeats? 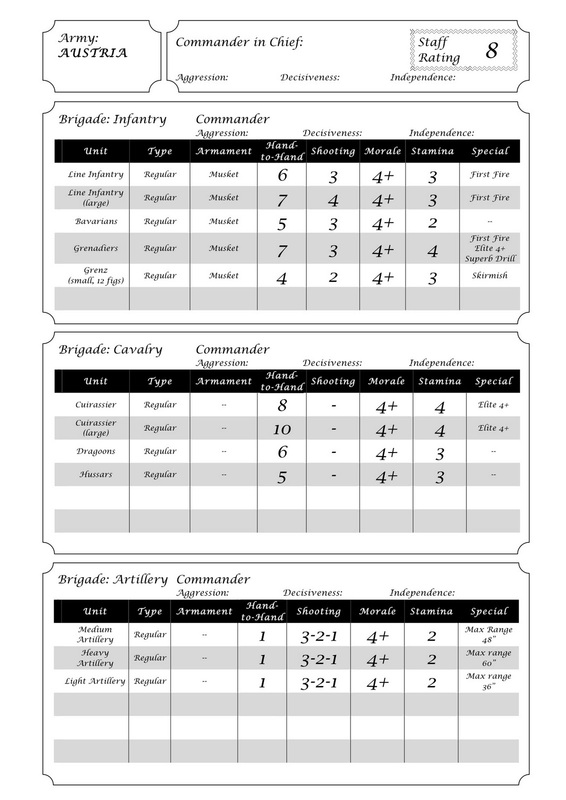 In a Colonial game I had last year the British had a very powerful brigade; highlanders, gurkhas, staff rating of 9. The player kept rolling 10s and 11s, so the highlanders stood about looking pretty while one company of gurkhas did all the fighting on that flank! 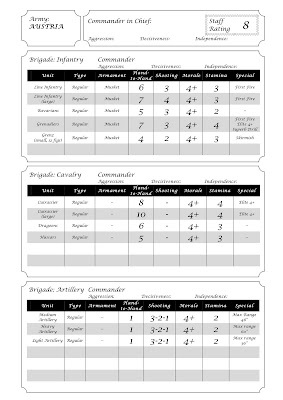 In a later history that Brigadier would then be degraded and a subsequent wargame would rate him very poorly all from that one set of 'bad rolls'. I like your figures btw. Thanks James. Zeiten and Seydlitz? Well, if I was doing an historical refight they might get a 10 if they had put in a great performance, or more normally 9. Brown I gave 9 in my Lobositz refight, with all other Austrian commanders 9. I agree about Leuthen/Kolin: Fred would get a 10 in both, and the difference would be on the dice rolls. Though in a refight, the crucial difference would be that at Leuthen the flank march was concealed, whilst at Kolin the flank march was in full view of the Austrians. So scenario set-up would help to account for the difference. Thanks for the detail re fusiliers - something to look into! Sorry, that would be Brown 9 and other Austrian commanders 8. Thanks a lot for bringing this fine book to my attention! I, too, have decided to buy the 1966 Hardback edition. It arrived safely today here in Germany. Friedrich's work is available online, but to have it in writing and with knowlegable comments is a real advantage!